Proudly serving the Elyria, Ohio area since 1968, we’re a premier full-service florist that is family-owned and operated. We hope you enjoy your online shopping experience with secure 24-hour ordering right at your fingertips. 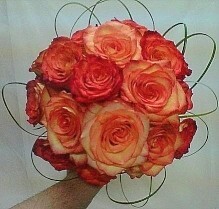 If preferred, you may call us to place orders direct at 440-323-5421. 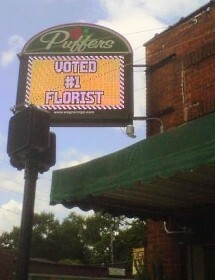 Puffer's Floral Shoppe was voted as the #1 Florist in Lorain County by Pulse's Magazine's Best of Lorain County! 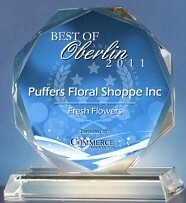 Puffer's was selected for the 2011 Best of Oberlin Award in the Fresh Flowers category by the US Commerce Association (USCA). Puffer's Floral Shoppe was also awarded Innovator of the Month for September 2011 by Bloomnet's Floriology Mazagine and has been a Top 1000 Florist for FTD for over 30 years! When You Need Something Special, Like Beautiful Wedding Bouquets... Fresh Flowers to Express Sympathy... or Wonderfully Unique Gifts for Any Occasion... Puffer's Floral Shoppe, Inc. Has It All! * You can always depend on our courteous staff to help you with flowers for the funeral of a departed loved one or friend. We will design and deliver a funeral arrangement that beautifully conveys your expression of sympathy and serves as a lovely memorial to the deceased. 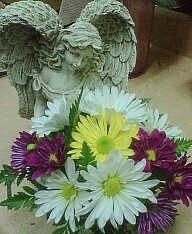 We also offer Sympathy throws, Angels and other memorial gifts. * Wedding Flowers and Party Flowers from PUFFER'S FLORAL SHOPPE, INC. will ensure your special day is a blooming success!! 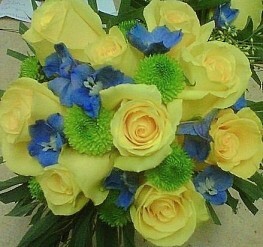 Call us in advance at 440-323-5421 to set up an appointment with one of our floral professionals. * Shop for a variety of Unique Gifts, including clothing, purses, fashion jewelry balloons, Gourmet from Walnut Creek and Dutch Valley, Yankee candles, silk arrangements, home décor items, baby gifts, Suzin L Chocolates and more! Call or visit us today… we look forward to meeting you! Thank you for visiting our website for flowers delivered fresh from a local Elyria, OH florist and easy online ordering available 24 hours a day.